Chicken Breast in Jelly is a convenient portion pack which contains 55% chicken breast. The pouch also contains chicken liver, beef or lamb. These are ingredients are cooked in a tasty jelly made from seaweed. 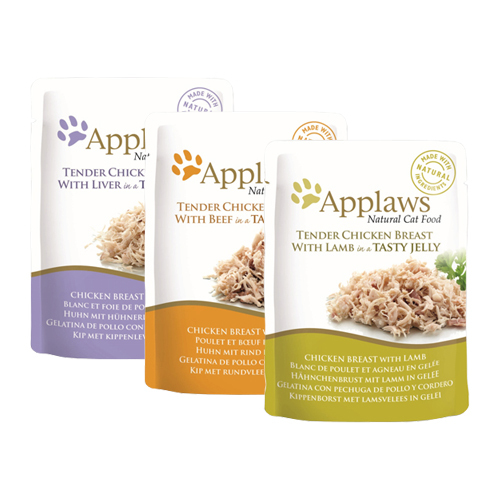 Applaws developed this wet food specifically for chicken lovers! Each pouch is packed with lean chicken meat. The three different flavours are supplemented with chicken liver, beef or lamb. This combination of ingredients makes this wet food a tasty meal for your cat. Chicken Breast in Jelly is available in different varieties: Chicken Breast & Liver, Chicken Breast & Beef and Chicken Breast & Lamb. All varieties are naturally rich in taurine. This nutrient supports the condition of the eyes and is beneficial for the heart. Chicken Breast & Liver: Chicken breast fillet (55%), chicken liver (7%), vegetable gelling agent (1%). Chicken Breast & Beef: Chicken breast fillet (55%), beef (7%), vegetable gelling agent (1%). Chicken Breast & Lamb: Chicken breast fillet (55%), lamb (7%), vegetable gelling agent (1%). Have you used Applaws Cat Food - Chicken Breast in Jelly before? Let us know what you think about this product.